Top 10 Must-See Places In Russia For You To Visit This Year ! Home » Travel » Top 10 Must-See Places In Russia For You To Visit This Year ! The largest country in the world, Russia offers a broad array of travel experiences, from treks up the slopes of glacier-capped mountains to strolls along the shoreline of Earth’s oldest lake. Historical sites and cultural activities in the country’s great cities abound as well. 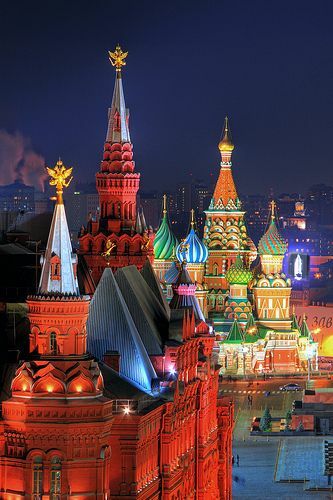 Red Square, Moscow, Russia … one of my favorite places in the world! Red Square, Moscow, Russia .. Built directly east of the Kremlin, Moscow’s historic fortress and the center of the Russian government, Red Square is home to some of the country’s most distinctive and important landmarks. Its origins date to the late 15th century, when the Muscovite prince Ivan III (Ivan the Great) expanded the Kremlin to reflect Moscow’s growing power and influence.